This was a very therapeutic sand tray for me. I have been very agitated, frustrated, and just plain old “volcanic” about losing my job. It was very helpful to sit and actually think about the moods or “transformations” that I go through when becoming so angry that “I blow my top”. 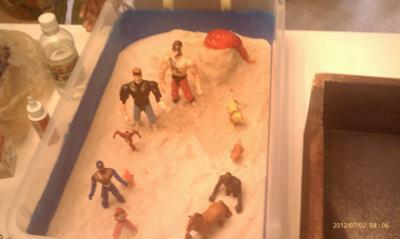 My sand tray depicts both the path to the explosion and the “calming” path afterwards. I see myself as generally a quiet, calm person but when something or someone starts to agitate me, I undergo a series of transformations. The first change is that I become really quiet and seem to put on a front (masked superhero) as if nothing is bothering me. In this stage, I am mentally trying to reconcile things so that I do not reach the next stage. The alligator represents the second change in mood that occurs. At this stage I become “snappy”. This is a bad stage for me to be in because I take on an “I don’t care” attitude and my reptilian brain becomes active. This stage is defined by my words, which often are hurtful to another person or to me. The third stage is represented by “Flash”, the superhero. In this stage I am in the fight or flight mode. I am trying to reconcile if this is a battle I want to take on or do I need to remove myself from the situation until the situation has calmed down. If I am not able to escape the situation and I am faced with standing my ground, I begin to tense up; my fists clench and open repeatedly. I am not a violent person, but clenching my fists and then opening them, releases the adrenaline needed for the next phase. The fifth stage involves the “trash talking wrestler” who says “bring it on”. As the adrenaline pumps furiously through my blood, I reach the point of no return. The volcano erupts and I am “out for blood”. This stage is bad because my temper spills over to everything and everybody who gets in the way. Once I hit the volcanic stage, it takes a long time for me to calm back down. I suspect it is because I rarely get past the alligator stage. When I finally do reach the volcano stage, there are a lot of past events that I have managed to keep below ground level. When I explode with fury, it comes from deep down; from all the times I repressed my feelings and just walked away. As I start to calm down, I am more like a roaring lion. I am still agitated and can easily be provoked to the volcano stage. The next calming stage is the tiger. The tiger is on alert because the environment is still unpredictable. The tiger just wants to be assertive rather than aggressive. The tiger fades into the gorilla. The gorilla wants just wants to find a place to sit down in the shade and chill out. This is the time I reflect on what happened; it is also a time where I may feel remorseful for anything I may have done or said that is totally out of character. My final calming stage is the brown horse. I just want to be “free”, not tied down with others. I just want to “chew on the grass” and be left alone.